Make of this variant cover what you will. 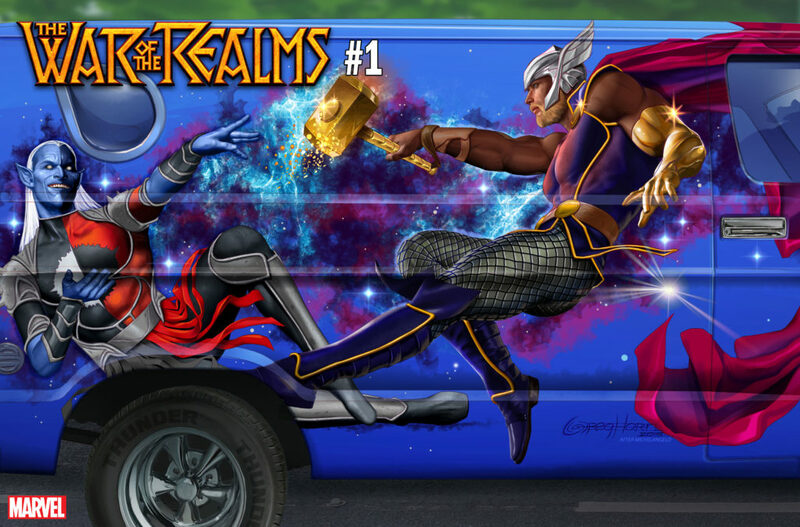 Marvel has what they’re calling a “van art” cover ready for War of the Realms #1. Do you remember van art? It’s kind of something that you don’t see much of any more, but it used to be everywhere. You have to go back a few decades, but it wasn’t unusual to find vans decorated by some way out designs. These’d usually be painted across the side, and could have been anything, including dragons and other fantasy figures. Again though, you don’t really see this phenomenon anymore. Though that’s not going to stop Marvel Comics from issuing a variant playing off the theme for the upcoming first issue of War of the Realms. I guess it’s kind of fitting. After all, we’re talking about fantasy themes and that’s pretty fitting for War of the Realms. The Marvel Comics event series is very Thor-centric, and is loaded for bear with trolls, gods, and elves. That includes Malekith, by the way, who we see here battling Thor in this piece by Art Adams and Matthew Wilson. Check it out below, and then get ready for War of the Realms’ launch this April.